Rev Fran: "Cross of Resistance." A Sermon from Littlefield Presbyterian Church on the Second Sunday in Lent. "Cross of Resistance." A Sermon from Littlefield Presbyterian Church on the Second Sunday in Lent. But this is contrary to everything Jesus did during his ministry. In his inaugural speech in the synagogue in Nazareth, he proclaimed what his spirit-given mission was to be: to bring good news to the poor, to proclaim release to the captives and recovery of sight to the blind, to free the oppressed. And that’s what he did. He liberated people, spiritually and physically. He took away their blindness, set them free, spoke up for the voiceless, dined with marginalized and outcast people, and fed the hungry. So, to take up our crosses like Jesus can never mean being silent in the face of oppression. Jesus told his disciples to “take up their cross and follow me” a year before his trial and execution. His disciples at that time would have heard it very differently from the way we hear it today. To the disciples, a cross was a method of torture and execution, by the Roman empire’s occupying forces. It was an instrument of terror. So, this isn’t an easy teaching. Peter hears all this talk of suffering and death, and he knows this is no way to be the Messiah or to successfully build the kind of organization he had in mind, so he takes Jesus aside and rebukes him. What does that mean? What does it look like? Many of the leaders of the movements to abolish the slave trade and the institution of slavery in Great Britain and the United States were Christians who felt called to speak truth to power, to work for the cause of God’s justice for all. Also during World War II, ordinary Danish Christians who saw their Jewish neighbors being rounded up by the Nazis and sent to concentration camps… and responded by ferrying many of them by night to safety in Sweden. Sophia Scholl was a German student and anti-Nazi political activist. A Christian, she had been brought up in the Lutheran church. Sophie and her older brother Hans were part of the White Rose, a small non-violent, intellectual resistance group that conducted an anonymous leaflet and graffiti campaign which called for active opposition to the Nazi regime. Their pamphlets used both Biblical and philosophical support for an intellectual argument of resistance. Sophie and her brother and another student were caught and convicted of high treason and were executed by guillotine. On May 2, 1963 in Birmingham, Alabama, the first day of the Birmingham children’s crusade, some 800 students, first graders through high schoolers, skipped classes. They gathered at the Sixteenth Street Baptist Church and marched holding hand-made picket signs reading “Segregation is a sin” and “I’ll die to make this land my home.” By the end of the day, under Bull Connor’s orders, more than 500 kids were behind bars charged with parading without a permit. Over the next two days, young protesters hit the streets in masse, confronting police armed with snarling German shepherds and water cannons. When people around the country saw these images, it changed things. It was then that President Kennedy and the attorney general began considering a path toward comprehensive civil rights legislation. We know this—though sometimes we forget and need to be reminded. I love the way David puts this hard saying of Jesus into perspective, this saying about what it means to take up his cross and follow him. Every time we let ourselves be vulnerable to the needs of those around us… every time we give ourselves in love to another… every time we get out of our own way and seek not what we want but what the world needs, we come alive, we are lifted up, we experience the glory of God made manifest. On some level, in some ways, we know this is true. We do it most naturally as parents, sacrificing all kinds of things in the hope of providing for our children. But we also do it as friends, partners, and neighbors. But sometimes it’s hard for us to believe. It’s counter-cultural. So much in our culture wants to make us think that we’ll only have security and happiness if we gratify our immediate desires. The world of advertising exists to make us feel incomplete in order to convince us to buy something that promises to make us feel better about ourselves. But so much of what’s in those commercials and so much in the popular culture are lies. Nothing that we can buy or build has the power to make us feel more complete or accepted or loved or safe. The only thing that does is connection to others, in community, and a purpose beyond ourselves. And this requires sacrifice. The good news is that—when we move beyond being preoccupied with ourselves and look to the needs around us, and others begin to do the same, we discover more life and joy and acceptance and love than we could have imagined. Christians from the United States and around the world go to the Holy Land as part of Ecumenical Accompaniment, to accompany Palestinian farmers to their olive groves during harvest… or to help school children get to school safely in Hebron. Others work through organizations like Pal Craftaid and fair trade olive oil producers, to partner with Palestinians to sell their products, to help people living under occupation support their families and meet educational and humanitarian needs. Closer to home, people take time out of their busy lives to stand in support of people who are being torn apart from their families and deported. We write letters or make phone calls to elected officials to advocate for those who are hungry or oppressed or to support gun safety. We work to feed the hungry at home and throughout the world… we support Habitat for Humanity and Heifer Project and One Great Hour of Sharing. We do these things because the needs are great. But we also do these things because we need to do them, as we follow Jesus on the way of the cross… as we set our minds, not on human things, but on divine things. When we follow Jesus on the way of the cross, we begin to comprehend that God’s ways are not our ways: that faith is not certainty, hope is not optimism, and love is not painless. 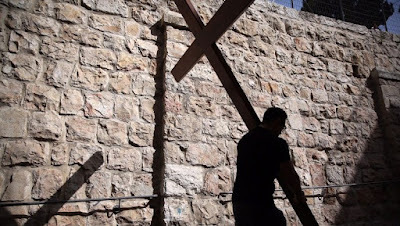 On my pilgrimages to the Holy Land, we walked the Via Dolorosa-- the way of the cross. Near the beginning of the Via Dolorosa, I saw a group of crosses propped up against a wall, where pilgrims could take up a cross and carry it as they walked the Via Dolorosa. Paul Shupe suggests that perhaps what we need is a multitude of crosses, one for each of us, at the doors of our sanctuaries, to be taken up as we return to the world of home and family, work and commerce, service and play—symbols of the call to discipleship that we have heard-- for us to accept anew. We believe in a God who is powerful to overcome sin and death in the Resurrection. We believe in a God who keeps promises. We believe that, in the fullness of time, Christ will return. When we pick up the cross and follow Christ, there may be darkness and death on the road. But we know that the darkness does not overcome the world, because we have God's promises. The cost of discipleship seems high. And it is. But we have Jesus' promise: Those who lose their lives for his sake-- will save their lives. Philip Halle, Lest Innocent Blood Be Shed,” 2008. David L. Bartlett; Barbara Brown Taylor (2011-05-31). Feasting on the Word: Year B, Volume 2, Lent through Eastertide (Kindle Locations 2623-2625). Westminster John Knox Press. Kindle Edition.